Sleepless during the 3am witching hour, little orphan Sophie (Ruby Barnhill) spies a giant lurking in the shadows of London’s streets. However, the giant has also seen her. Reaching in with one enormous hand, he spirits her away to Giant Country. Terrified, Sophie tries to escape - only to realise that there is simply nothing to be afraid of. For this is a Big Friendly Giant or BFG (Mark Rylance). The two strike up an unlikely friendship - one that will take them on a wonderful adventure full of magical dreams, human bean eating giants, Frobscottle and whizz pops! is a truly magical family film. This is familiar territory for director, Steven Spielberg, and from the opening scenes we know that we are in safe hands. Mark Rylance is superb as the Big Friendly Giant. The very latest in motion capture technology transforms him into an enormous flappy eared creature. However, unlike many computer generated (CG) creatures, the BFG feels real and has actual heft. Things have certainly advanced since Robert Zemeckis’ The Polar Express (and even since Spielberg’s last mo-cap film, The Adventures of Tintin: The Secret of the Unicorn). Crucially, these advancements ensure that the CG effects sit perfectly with the film's live action sequences. The BFG’s facial expressions are wonderful - kind and (of course) friendly, with a quirky sense of humour that runs throughout the film. In addition, far from being irritating, I found the BFG’s jumbled up speech endlessly endearing. Mathison also wrote the screenplay for E.T. and there are many similarities between the two stories. 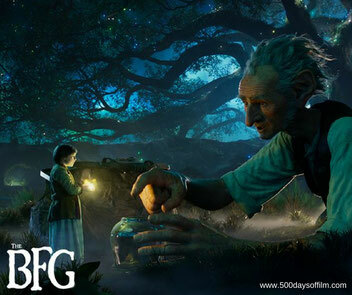 As was the case with Elliot and E.T., the BFG steals Sophie’s heart, and ours too. While casting the BFG was relatively easy (Spielberg having worked with Rylance before on Bridge Of Spies), it proved far more challenging to find the perfect Sophie. According to an interview with Empire Magazine, the director watched 30 audition tapes a week before he discovered a ten year old actress called Ruby Barnhill. In the interview, Spielberg describes the “untapped fire” in Barnhill's eyes and, after spending a day with her in Berlin, knew that she had the part. Spielberg’s instincts were (unsurprisingly) spot on. Barnhill delivers the perfect combination of vulnerability and strength. Rylance and Barnhill are joined on screen by a strong supporting cast. Penelope Wilton is dignified and hilarious as The Queen (love those corgis too). Meanwhile, Jemaine Clement is great as the Fleshlumpeater and Bill Hader portrays the Bloodbottler with verve. While the film avoids the darkness of Dahl’s novel, these giants inject just the right note of peril into the story. The BFG was shot by cinematographer Janusz Kaminski (Saving Private Ryan, Schindler's List) and each scene is utterly gorgeous. The sequences in Giant Country are truly magical - particularly when the BFG shows Sophie his dream collection. Meanwhile, the film’s score is as glorious as we have come to expect from genius composer, John Williams. Pure perfection in every note. The BFG is a lovely family film from a writer and a director who understand the magic of storytelling and the wonder childhood. Tragically, Melissa Mathison died in November 2015 of neurendocrine cancer after The BFG’s shoot wrapped. 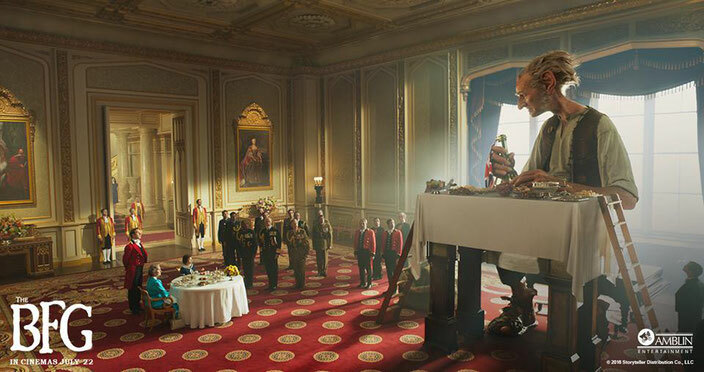 Have you seen The BFG? If so, what did you think of Steven Spielberg’s latest adventure?